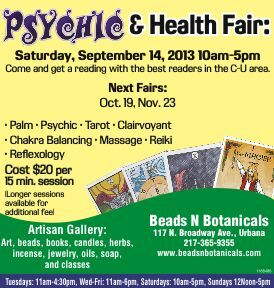 Come for a session with the best readers & healers in the Champaign Urbana area. Healing sessions to include: hand or foot reflexology, Reiki energy healing, Chakra balancing, Cranio Sacral and more. Cost: $20 per 15 minute reading. Longer sessions available at additional cost.